Food halls — the more sophisticated cousin to food courts — are on the rise in cities all across the United States. Evolved from the traditional market places where proprietors would gather to sell their specialities, the modern food hall borrows that notion of authenticity; but, instead of setting up shop in a mall or airport, vendors typically repurpose old factories or warehouses and often feature locally produced or sourced food. On the occasion the food halls are built from scratch, they are often located in budding city centers where foot traffic is a sure bet. And with more than 100 modern food halls dotting major cities, it’s becoming easier to choose where to eat local — and in style. And according to commercial real estate firm Cushman & Wakefield, more options are on the way. The number of food halls are expected to double by 2019. Food halls give people the ability to walk through an architecturally interesting building and have choose from a number of cuisine options. Some food halls are refurbished warehouses or train stations, while others are new construction. Regardless, you find open and airy spaces that use interesting materials to create intimate spaces in a sea of bustle. Food halls take a more local twist on traditional food courts, allowing local vendors to set up shop in an area supported by other local businesses with strong foot traffic. One of the oldest markets in the United States, Union Market (then called Centre Market) was born as fresh food venue born over 200 years ago. After being forced to relocate to make room for the National Archives, it reopened as the Union Terminal Market in 1931. The market featured large, airy, well lit indoor stalls for 700 vendors, cold storage vaults, elevators and a public café. Through the years, another move, and a rough period in the 1980s when vendors abandoned the city for the suburbs, Union Market today is a bustling center of commerce and cuisine. 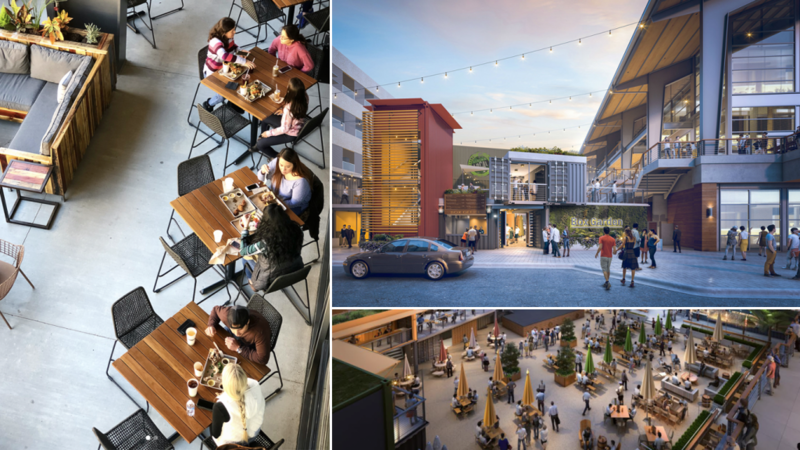 Keeping true to its original open and airy design, today the renovated industrial space features more than 40 food vendors, shops and work spaces. 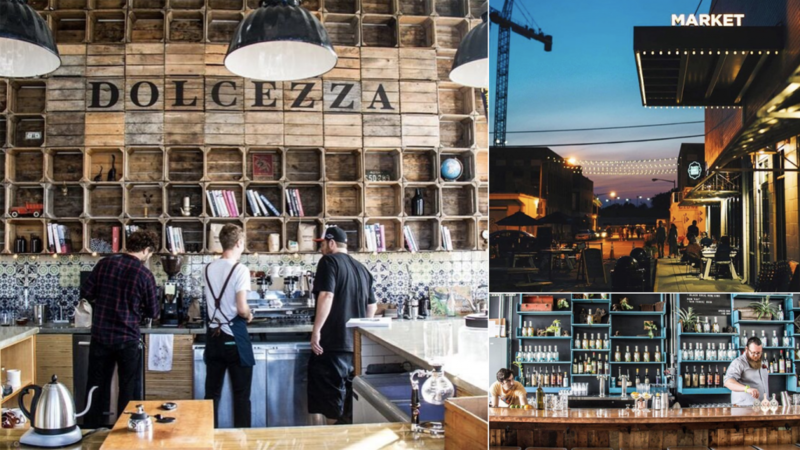 Former loading docks serve as dining patios, creative lighting forms attractive spaces, and flexible wall coverings make the concrete structure usable. Deep in the heart of Texas, the newly opened Legacy Hall in Plano is a combination of food hall, craft brewery, beer garden and entertainment platform rolled into one. The three-story development includes seven bars and over 20 vendor stalls, including one that rotates regularly according to an Eater article. Whether you’re in the mood for chicken, donuts, fruit or seafood, the Legacy Hall has it covered. Built out of a combination of shipping containers, repurposed pallets, glass and steel, this brand new hall benefits from an indoor-outdoor flow. This old brewery bottling department turned food hall sits near the San Antonio River. Its renovated design still echos its original 1800s industrial factory look with exposed brick and salvaged cornerstones. The new mix of contemporary features like natural wood-like element, straight lines, and pops of color make for a time transportive experience. Though a smaller food hall featuring just five chef-led vendors, the Pearl’s Bottling Department’s new purpose is to bring forth a culinary collaboration between, farmers, ranchers, chefs, and food lovers. The rise of the food hall is changing the way people dine out and with the abundant choices, is a guaranteed crowd pleaser. 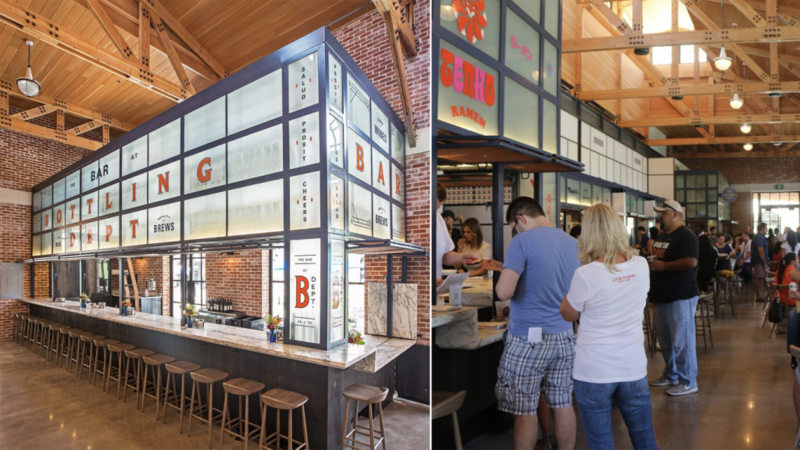 We’re excited to see the creative design (and delectable concoctions) food halls are rolling out in more cities across the U.S – keep a look out for one near you!